The My First Lab Mini Duo-Scope is our most affordable micrsocope yet! Don’t let the price tag fool you; made with durable, industrial grade plastic, this microscope is as reliable as it is inexpensive. Just like the Duo-Scope before it, this scope features light sources both above and below, allowing you to view both biological slides and solid objects. Specially coated lenses provide protection from mold and ensure that you’ll get the best clarity in viewing experience, comparable to professional industrial standards. Constructed of sturdy plastic, this basic portable microscope is ideal for children learning basic functions and components of a microscope. Available in a vibrant blue color with non-removable parts for safety. Our most popular kids microscope! You would need two instruments to view what this one does- a basic biological or compound microscope to look at specimens on a slide (light shines up from under the slide and through the tissue) and a traditional dissecting microscope to view solid objects at lower power (light shines down onto the specimen to be observed). This new combination scope with dual lighting allows for both kinds of applications. 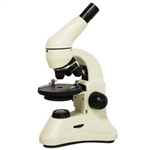 This microscope is excellent for studying insects, pond water, rocks, plants, and three-dimensional specimens. Ideal for both classroom and field trip use. The i-explore is an affordable, student-grade binocular inspection/dissection microscope. Its simple design allows you to examine everyday objects at 20X with stereo vision. Standing out from the competition, this microscope has top and bottom illumination so it can be used as a stereo or biological microscope. With the My First Lab Whodunnit? Detective Spy Scope your child can be a super sleuth! Following clues and cases that are both challenging and fun! Details:This new economy model combines the quality of the My First Lab with the upgrades of the MS series for greater options. Equipped with the mechanical stage which allows smooth and easy adjustment of slides left/right or backward/forward during observation as well as both coarse and fine focusing controls, popular features for educational use. One of the best student microscopes in the market today. With extra features such as the rotatable head, fine focus control, and the option to add the mechanical stage, these scopes are a popular choice for educational use.